I first became aware of Andres Serrano's Piss Christ in a conversation with Howard Fox, then curator of contemporary art at the L.A. County Museum. I was inquiring to see if Fox might consider curating an exhibition of Christian art on the west coast. As it turned out, he was to show the Piss Christ in Los Angeles and, using it as an example, wanted to know how broadly I might define Christian art. To consider a crucifix, even a plastic one, submerged and photographed in the artist's urine as Christian art was a stretch for me. It proved to be an even greater problem for the believing Christian community in North America as the Piss Christ was pared with Robert Mapplethorpe's X Portfolio, a truly pornographic series of photographs, to become the centerpiece of the controversy over the American public funding for the arts. For many, the Piss Christ became a symbol for the secular assault and hatred against the Christian faith. The pain of that assault was made even more acute for the Christian, as it was clear that the culture wars were not being engaged on a level playing field. Would the National Endowment for the Arts, a government agency, equally fund a piece of art that held up a feminist icon for ridicule? Or a piece that clearly was a pro-life statement? Or a piece that was a non-ironic Christian image based on the tradition of a thousand years of art in the West? Most likely not. And yet it seemed that any conceivable perversion or blasphemy was up for a positive evaluation for funding with public monies at the NEA. It was an especially difficult time for a serious Christian artist. On the one hand, the art culture seemed to praise the shock value of an artist's work as a measure of its merit. On the other hand, the art world was being attacked by Christians who had rarely seen art as having importance. 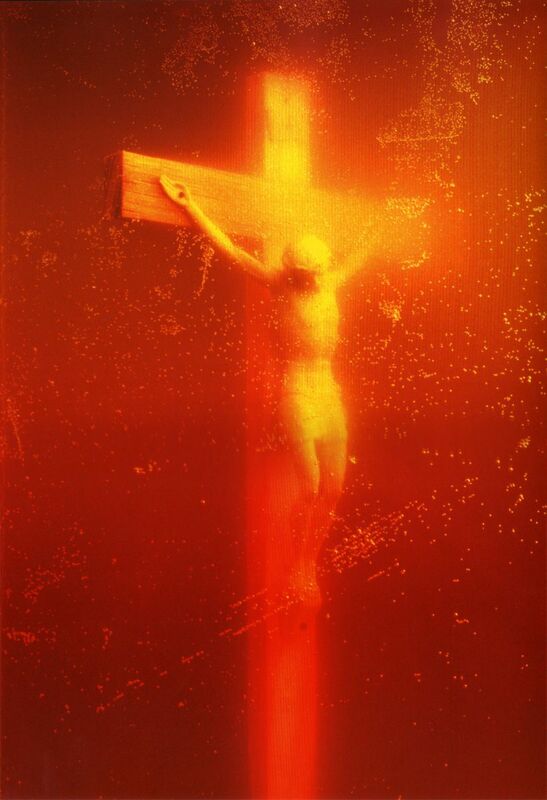 In the midst of this was it possible to see Andres Serrano's Piss Christ with any clarity at all? The image in and of itself is quite beautiful as we see a crucifix almost nostalgically glowing in a golden mist of timelessness. It is the title that offends. In our social context to deliberately pee on a person or thing is a degrading act used to show extreme disrespect. When the golden mist of nostalgia is transposed in the mind to yellow offal, it is a profound jolt to the emotions. For us, urine is a nasty human necessity that should be thought about as little as possible. It doesn't help to intellectualize it, seeing the yellow liquid as an agent for whitening as did the ancient Romans, or as having medicinal properties as did Mahatma Gandhi. It doesn't help to know that Serrano's artistic vocabulary often incorporates bodily fluids or that he was reared as a Roman Catholic and still declares himself to be a Christian. Nor does it help to know that in this piece he may have been attacking the reducing of one of Christianity's most precious and seminal moments to a plastic trinket. To try to hold something as dirty as piss and an object of holiness positively together in the mind is a bridge too far for most of us to cross. Emotionally, Christ has been pissed upon. Yet, at this time of the Christian year, Lent, we are to contemplate the fact that God in Christ has degraded himself by coming from the heights of heaven to the lowest cesspools of his fallen creation. During these 40 days, we are told to consider what Flannery O'Connor has called ‘the sweat and stink of the cross’. Now, think again about the Piss Christ. In the light of Lent, is not this ‘disgraceful’ art object somehow transformed from blasphemy into a statement of truth, even divine truth? I think that it is. I cannot help but see it as an instructive object that strips away our comfortable romantic clutter that leads to chocolate Easter eggs, and releases the incarnation so that we can once again wrestle with the hard reality of what Christ has done for us. I think that Serrano's piece powerfully holds before us the fact that our Lord has entered into all of our filthiness in order to reach us with his love. No matter what Serrano's intent or what this piece has become through the crucible of the culture wars, at this distance in time, from all of the shouting and wounded feelings of hard fought battles, the Piss Christ has become for me an elegant statement of the Christian truth that should be at the heart of our contemplation during the Lenten season: the fact that our dear Lord and Savior has come, and is here, to powerfully redeem the likes of us with his love. Andres Serrano has given us a truly remarkable and appropriate image for our penitential journey. May our Lord add his increase to our understanding of the truth of this image, so that we might have a deeper walk with him. Edward Knippers is a painter and printmaker living in Arlington, VA. His work has been included in over 150 exhibitions, half of which have been one-man shows and invitationals. These include exhibitions at the Virginia Museum, Richmond, the Los Angeles County Museum of Art, and Cheekwood, Nashville, TN. His work has also been exhibited at the Southeastern Center for Contemporary Art (SECCA). Knippers' art is included in numerous public and private collections including the Billy Graham Museum, Wheaton, IL; the University of Oklahoma Museum, Norman; the Vatican Museum of Contemporary Religious Art, Rome; and the Grunewald Print Collection at the Armand Hammer Museum in Los Angeles. VIOLENT GRACE, a retrospective, a monograph on his paintings was recently published by Fresco Fine Art Books, Albuquerque, NM. See: www.edwardknippers.com; e-mail: ecknippers@aol.com.